Colombia boasts many regional musical traditions that remain firmly rooted among newer generations. One of these is música llanera, music of the expansive eastern fluvial plains that water the mighty Orinoco River and continue into western Venezuela. Ranchlands stretch across the region, and more than a century and a half of cattle herding has left a mark on the lifeways of its people. In the late 1900s, petroleum extraction began to compete for economic primacy. On one hand, the region’s musical heritage evokes centuries of sounds and sentiments of its Spanish colonial past and the postindependence period of the 19th century. Harps, guitars of different varieties (bandola, bandolina, bandolón, six-stringed guitar), violin, maracas, friction drums (zambomba or furruco), and rasps (chácharo and carraca) point to Spanish and perhaps indigenous sources. The rhythmic drive and cyclicality of the music may reflect the style and sensibilities of enslaved African people and their descendants in the Americas. At the same time, the contemporary sound of música llanera is very much a product of its successes in the commercial music industry of Venezuela from the late 1940s to the 1970s, when recordings of music from the Venezuelan portion of the Orinoco River plain, along with radio, and,later, television and film, catapulted favored groups and musicians to the front row of public life. Some of the more notable were harpist-composers Ignacio Figueredo (“El Indio Figueredo,” 1899– 1995) and Juan Vicente Torrealba (born 1917), singer Ángel Custodio Loyola (“El Renco Loyola,” 1926–1985), and bandola player Anselmo López. The fast-paced, triple-meter joropo music they espoused, accompanied by footwork-intense couples-dancing, became an icon of regional and national identity, and several of the “next-generation” plains singers, such as Reynaldo Armas, continue to attract national and international audiences. The greatest impact of the commercial success of música llanera was felt in the plains region on both sides of the Orinoco. Radio airplay intensified the “feedback loop” of music recorded by local musicians to all parts of the plains area, in Colombia and in Venezuela. In Venezuela, the plains-style joropo became by far the best-known of the many regional varieties of Venezuelan traditional music. In both countries, the variety of homegrown musical instruments used to interpret the joropo were superseded by a more uniform, “standard” sound, consisting of harp or bandola llanera, cuatro, maracas, and later, acoustic or electric bass. The plains harp has a unique structure, sound, and playing technique, all of which distinguish it from the many other types of Latin American folk harp found in Venezuela, Mexico, Paraguay, Ecuador, Peru, and elsewhere. As with other harps, one hand (usually the left) focuses more on the lower-pitched strings to play bass and chords, while the other hand plays melody on the higher-pitched strings. The regional bandola, not to be confused with other Latin American guitars with the same name, is a four-stringed guitar, plucked with a small pick in a fast-moving technique developed largely by Anselmo López. The principal instrumental melody is played by either the harp or the bandola, though seldom by both at the same time. The cuatro is a small four-stringed guitar, whose loosely tensed strings allow the player to create a multitude of rhythmic-percussive effects, giving an essential character to the joropo sound. The popularity of the cuatro has spread far beyond the plains region among Latin American folk-music performers throughout the Americas. The deceptively simple-looking pair of maraca rattles is the source of a great variety of subtle sonorities and complex rhythmic accompaniment. Most are fashioned from the totumo gourd, with a stick handle and small seeds or pebbles inside. Accomplished maraca players (maraqueros) may carry two or more pairs with them to a performance to allow a choice of sonority (e.g., pitched higher or lower, crisper or softer). The addition of the bass both freed the harpist to devote more attention to the melody and conformed with the international popular music trend favoring a strong bass presence in the mix. The typical plains vocal style is also distinctive and regionally uniform. Slightly nasal, usually loud, and always extroverted, it is appropriate for the two principal musical genres of the region, both in a form of triple meter: joropo and pasaje. The characteristically aggressive (recio) style of joropo is fast-moving and word-heavy, with singers adding heated emphasis to the text. Often, competition among singers invites them to outdo one another at spontaneously improvising verses on a set topic, sometimes exchanging insults in the process. These competitions, long a frequent part of plains social occasions, have been formalized into high-profile competitions for prize money. Not all joropos are sung, but among those that are, none is more popular than the minor-key pajarillo and major-key seis por derecho. In both, the singer typically launches his song with a long, loud, high-pitched sustained “aaay” called a leco. The pasaje is a slower-paced, more lyrical song, with fixed verses and melody. In the joropo, men predominate as professional musicians and singers, though a few women, such as Ana Veydó of Cimarrón, have been carving out their own space as leading interpreters of the joropo recio. In Venezuela, música llanera became a “musical flag” of national identity, while on the Colombian side of the Orinoco, the music remained largely local and unfamiliar beyond its region. Colombian history and geography to a great extent left its periphery isolated from its political power center, the highland Andes geographical backbone anchored by the national capital, Bogotá. The last several decades of the 20th century saw the rise of music from other regions, first as a result of their commercial success, then validated by official government recognition and support. Accordion-driven música vallenata from the Caribbean north, for example, invaded Colombia’s largest cities—Bogotá, Medellín, and Cali—and gained an international following, particularly in neighboring countries of northern South America. In another case, the marimba de chonta (palmwood marimba) of the Afro-descendant communities of the Pacific coast benefited from a surge of popularity in Cali, Bogotá, and beyond. Looking to the future, Rojas “redesigned” the basic musical ingredients of the joropo, bringing the rhythmic roots that resonate with the dance and that typically underpin the joropo’s melodies and harmonic accompaniment to the forefront of the sound. This meant both adding a rhythm box (cajón) to the instrumentation to evoke the rhythmic sound and spirit of the dance, and insisting that joropo dance (and song) be part of the performance whenever possible. This “new mix” creates “a new balance, a new relation among the acoustical weightings of percussion, strings, and voices within the joropo sound.” This innovation has played well to national and international audiences, as the group was invited to perform at the WOMEX world-music showcase in Seville (2008), WOMAD in London (2009), the biennial flamenco festival in the Netherlands, the Shanghai Exposition (2010), and tours in Wales, Western Europe, and the United States. In doing this, Rojas embraces stage performances as a necessary way to capture the interest of new audiences, to create new spaces in which to present the joropo, and to establish a niche for the joropo sound in the global musical marketplace, thus guaranteeing its survival as a living tradition in contemporary globalized society. For him, this approach keeps Cimarrón’s music within the flow of joropo tradition, returning to the sonic diversity that marked its precommercial sound and opening possibilities for new creativity that correspond to the expectations of new social contexts. Through exquisite musicianship and challenging arrangements, the Colombian group Cimarrón pushes the frontiers of traditional música llanera, the music of the Orinioco plans. Here, Carlos Perez, Luis Moreno, and Carlos Rojas discuss the nation of ranch life and the music it inspires. 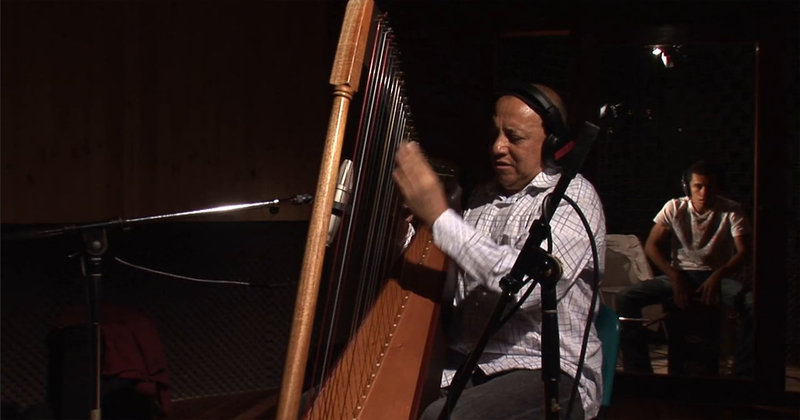 Members of the Colombia plains ensemble Cimarrón perform “El Guate” (The Foreigner) in a Bogotá studio. 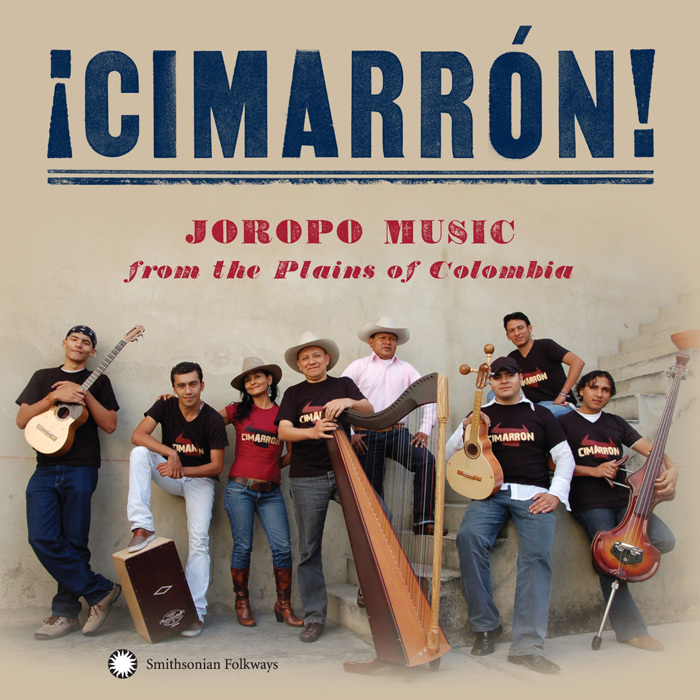 Cimarrón is known for its daring interplay of harp and bandola, aggressive rhythms, and improvised melodies.